– Any hard, dark bakers melting chocolate or chips, roughly ¾ – 1 cup. Cut 20 x 2 ½” sections, of thick white string or yarn (you may need spares). Tie a small knot at one end of each string. Heat your oven to 200 and melt a small portion of paraffin wax in a small ceramic dish, takes only 2 – 3 minutes… it can be very carefully microwaved, or heated slowly on the stove-top, but it’s MUCH, much safer and more controlled in the oven, and at a set temp. I like to use a combination of oils, both for flavor, and to create a varied oil ‘vehicle’ for cannabinoid bonding and availability, some thinner and some thicker. 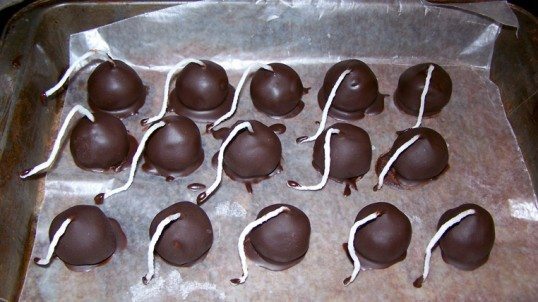 In the end, you want it to be a solid at room temp, so your canna balls aren’t too soft, and the chocolate keeps its shape and thickness. The additional liquid oils I’ve used in addition to the solids, had previously been infused with herb. Take enough peanut butter filling, so that when rolled, it should create roughly a 1.25 – 1.50” diameter ball. If you’re not using them right away, I recommend letting them sit for a few hours, as they are on the pan, while freezing. This is a Bad Kats collection recipe!